Particularly large coverings demonstrate the range offered by the manufacturers and processors of these textiles. Besides numerous design advantages, textile construction also offers a huge amount of individuality. Textile components are always custom-made – which is what makes them so interesting for architects. Goal-oriented collaboration with the respective companies also guarantees the best possible results. When one thinks of textile architecture, then one immediately thinks first of striking roof constructions. Even decades ago, roofs that showed off the possibilities offered by modern materials and technology while at the same time establishing a whole new aesthetic were spectacular in many respects. This potential of the revolutionary "other" is still inherent in roof structures of today and such properties still symbolically mark urban, social and cultural hotspots. 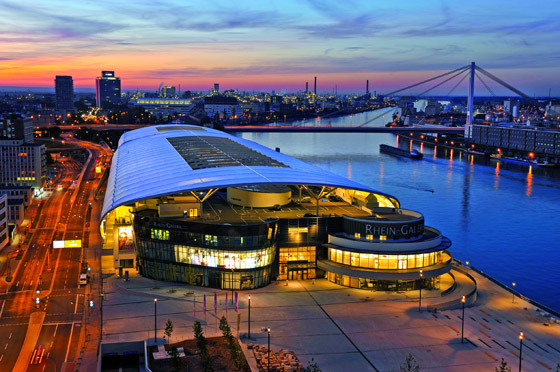 One outstanding example of this is the "Rhein-Galerie" in Ludwigshafen, designed by Hamburg-based ECE architects and completed a few years ago. The exposed situation in the former harbour area right on and parallel to the banks of the Rhine supports the already impressive construction in its fitting self-aggrandisement. 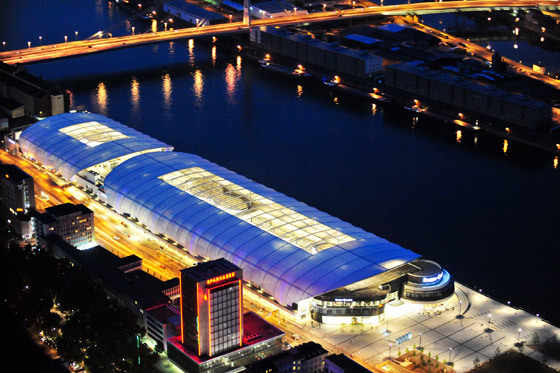 Like a wide, slighted rounded arched hall, the textile roof protects the actual building structure that offers a roughly 30,000-square-metre large shopping and dining area across two levels. From all perspectives, the white roof displays the typical tension of a membrane, the elegant and gentle undulation between the steel beams. As far and as high as the southern gable front opens – thus marking the main entrance – and as deep down as the design on the longitudinal sides extends, producing a calm dynamic with a uniform wave motion. The overall shape of the construction is best appreciated from the other side of the river. The membrane is a high-quality PTFE-coated (Teflon-coated) glass fabric, on which the rain washes away any normal soiling. The white roof thus remains white, guaranteeing, on the one hand, the desired light transmission and, on the other, a degree of reflectance that significantly reduces the amount by which the roof space heats up. The three-dimensionally curved tubular steel construction creates 68 individual areas or mechanically pre-stressed membrane fields. One important task for Sattler subsidiary Ceno Tec GmbH from Greven was to prefabricate these 68 membrane fields with customised sizes ranging from 70 to 380 square metres, so that no adjustments had to be made during assembly. A 3-D model of the steel construction company with mutually agreed tolerances formed the basis of this prefabrication. Biaxial tests to determine the tensile properties and the resulting bias of the material were also carried out prior to assembly. The assembly sequence of broad constructions always poses a challenge. In this case, for example, the bending sensitivity of the coated glass fabric was also taxing. The fabric was spread onto a belt net in a field; only then could it be secured on all sides. The pretension was then generated successively. Finally, the aluminium cover profiles with their sealing lips were mounted. For the approximately 24,000 square metres of covered floor area, about 33,000 square metres of material was processed within eight months. ... we need more green. When one uses textile materials, then something very unusual may arise. In stadia, for example, the difference between the roof and facade can be completely dissolved. The result of this visual effect is not so much a building in the traditional sense, but rather an object – an object with an enormous amount of magnetism and lure that dominates an entire district. 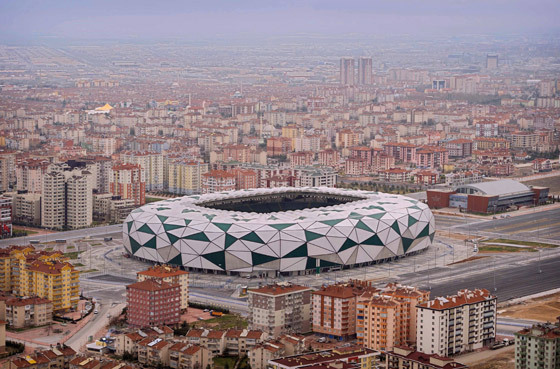 The Turkish planning team Bahadir Kul Architects from Istanbul succeeded in doing so with the Konya Stadium in Konya, about 200 kilometres south of Ankara. 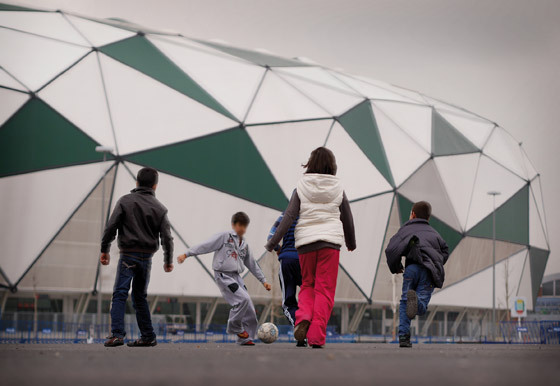 The multi-purpose arena in the suburbs of Turkey's seventh-largest city is just one belonging to a large sports-facility complex, the so-called Konya Olympic Village. It offers a good 42,000 covered seats. The large round form, curved on all sides, is structured by a large variety of irregular triangular faces in white and green. 76,000 square metres of the Valmex® FR 1400 MEHATOP F Type IV fabric was colourfully coated by Mehler Texnologies GmbH from Hückelhoven, Germany and assembled. White and green are the colours of the local football club. The green is not just any green. Since even a RAL colour can look different on fabric as it does on the colour sample fan, experiments were carried out until the right shade was found; a process that must not be confused with mixing paint in a hardware store. And it had to be right in any event because, due to constraints on production, coloured membrane coatings are applied on strips that are 2,000 metres in length. 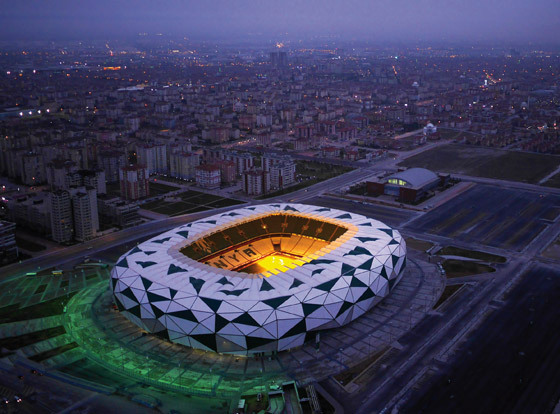 With the Konya stadium, the club president intervened at a rather odd moment, insisting on a marked increase in the proportion of green on the roof and facade. This resulted in a logistical problem, which allowed the order management team to demonstrate, in consequence, just how flexibly Mehler could respond to challenges. More green had to be produced. No technical problem in the proper sense of the word, then, but a logistical one, since the completion date for the stadium was not up for discussion. One thing one should know in all this is that the quality of the coating determines the quality of the entire shell. The individual surfaces are welded, not sewn together; this means that the transmission of all the forces in the surface depends on the adhesion properties of the coloured coating on the membrane, because the welding only binds the two surfaces concerned to each other. Everything was finally resolved in the prescribed time frame and the stadium has been meeting all expectations for a year already. The demand for more green was quickly confirmed as an acceptable change in the overall concept. Everyone involved had to be flexible.